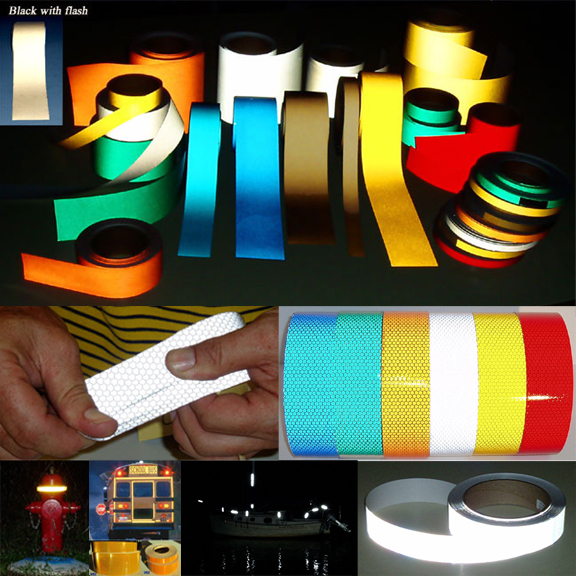 Welcome to our Reflective Tape Pictures & Specifications site. This is an image rich site that allows you to see all of the different colors and types of reflective tapes and their applications. The site is broken down by color, type (intensity), and application. Our Reflective Tape Regulations site has more information on what tape to use for specific applications. Our color category lists all the different colors that reflective tape comes in. Each article shows all the classes of tape in that particular color. This way, if you need a red reflective tape you are able to compare the different intensities as well as prices so that you can make a decision. Our type category lists the different types of reflective tape and then shows all the colors available in that type. This allows you to choose an intensity or price range and then see what colors are available in that category. Our final category lists different applications that reflective tape is used in. Each application articles shows images of the application and makes recommendations as to what color and type of tape to use. Any regulations that pertain to that application are also outlined. You can contact us at steve@reflectivestore.com with any questions of by phone at 850-934-3157. If you cannot find the pictures you are looking for let us know and we will post some. The tapes on this site can be purchased at www.colebrothers.com , shop.reflectivestore.com or www.reflects-light.com .